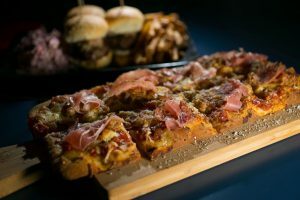 Bring your pizza dinner up a notch with this homemade treat that’s an instant favorite with kids and adults alike. Heat three tbsp. oil in a large skillet over medium-high heat. Sauté diced onions for 20 minutes or until golden. Add pastrami strips and sauté for an additional 5 minutes. In a small bowl, whisk together mayonnaise, garlic, black pepper, sugar, mustard and pickles. 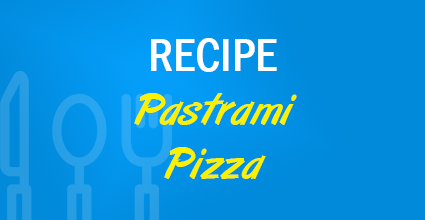 Spread a thin layer of the mayonnaise mixture over pizza crust, then top with the pastrami mixture. Drizzle with the barbecue sauce. If you’re left with more mayonnaise mixture than you can use, add 2 tbsp of water and 1 tsp of sugar for a delicious salad dressing. Makes a wonderful and healthy side to round out your dinner! You can swap the pastrami for pepperoni slices or your favorite deli meat.